Self-assembling peptides are short, synthetic peptides characterized by amphipathic sequences. These peptides are able to spontaneously self-assemble in aqueous solution to form highly organized structures such as hydrogels. GenScript can synthesize hydrophobic self-assembling sequences at high quantity and purity. Bioactive peptides are the most dominant component of animal venoms. Venom peptides can vary in length and complexity, thus their synthesis requires a combination of chemical and recombinant synthesis, both offered by GenScript. Functioning in the induction of natriuresis, (the excretion of large amounts of sodium in the urine), natriuretic peptides have been touted as useful biomarkers for the purpose of personalized heart failure treatments and are involved in maintaining heart pressure and volume, as well as regulating cardiovascular remodeling pathways. 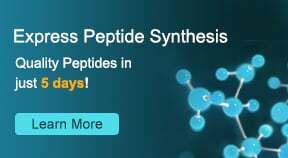 GenScript offers custom synthesis of natriuretic peptides and natriuretic peptide products. A pathological hallmark of neurodegenerative diseases is the abnormal aggregation of extracellular or intracellular peptides and proteins such as beta amyloid, tau, prions, and polyQ-hHtt. Custom peptides can be used to study aggregation, and develop aggregative inhibitors and vaccines. Nutrition aside, milk has gained recognition as a rich source of potentially therapeutic proteins and peptides that have a variety of functions, such as antimicrobial, antiviral, antioxidant, immunostimulant, and anti-hypertension activities. The prevalence of antibiotic-resistant microbes continues to hinder the treatment of a variety of diseases.